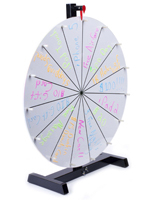 See how our customers are using their Prize Wheels to create interest, give away prizes, and welcome in new students. 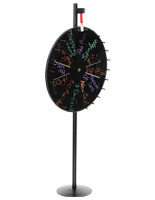 How will you use yours? 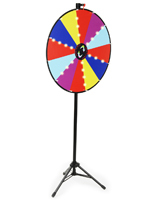 Looking for a fun, economical way to attract attention or build excitement at private and promotional events, meetings, or in everyday business operations? 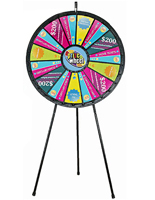 Prize wheels are a great choice for use in almost any situation that can benefit from an exciting focal point — from trade show giveaway fixtures that attract passers-by to in-office customer incentives to performance rewards. 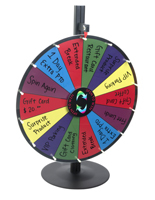 Roulette-style games of chance are designed to help attract visitors, invigorate meetings, conventions and conferences, special events, classes, or turn everyday business operations into fun for all involved. 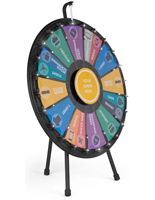 A variety of sizes, options, and designs allow this type of simple, cost-effective marketing accessory to meet the needs of almost any environment. 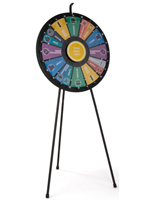 Our customizable prize wheels come in many different styles, from stylish high end models with slide-in inserts created from included templates to cheap write-on spinners that are ideal for daily use in offices or commercial environments. 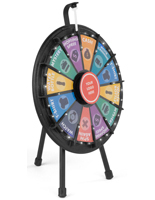 Dentists, children's hospitals and doctors, salons and other service businesses frequently find that adding an element of chance or a gaming factor helps turn everyday transactions into something special. 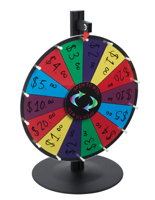 High visibility professional quality prize wheels, also known as spinning roulette fixtures with customizable slots, combine sight, sound, lighting, and surprise to create fun and excitment to please and attract people in even the busiest public areas. 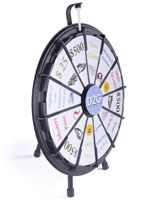 From economical table top cardboard models to elegant LED-lit floor-standing spinner fixtures, Displays2go offers a wide selection of giveaway stands that easily accommodate every need. 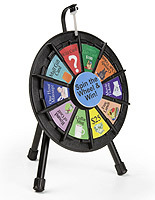 Where are spinning games of chance commonly used? 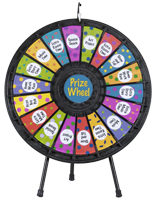 We offer our commercial-quality wheels of fortune in a variety of styles to make sure they will fit any occasion or need. 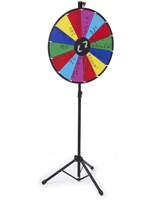 Placement options include floor standing, tabletop, mini spinners, and extra-large sizes, as well as portable versions designed to fit into carrying cases for safe and easy transportation to offsite conventions, conferences, or other specialty events. 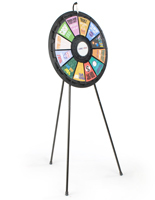 In addition, many spinner games offer height adjustable bases that allow a single fixture to accommodate both floor and countertop use as needed. 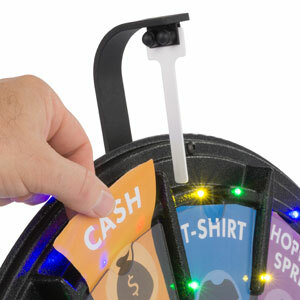 Illuminated gaming wheels, incorporating brilliant LED lights with changing color options, are a great choice for businesses trying to attract potential customers in crowded or busy public locations. 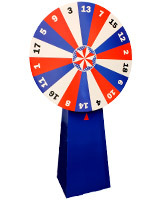 Some of the most important elements of spin-to-win game fixtures are the customizable slots that allow businesses, organizations, and vendors to tailor what winners receive. 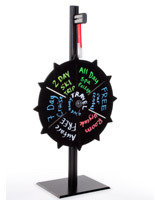 Cheap gloss-finish cardboard stands intended for single or short-term use with permanent markers can be a great DIY alternative for specialty conventions, conferences, or one-time promotional events. 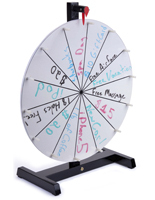 More durable styles with reusable write-on surfaces are great for fast-paced businesses that need to swap-out changing selections frequently. 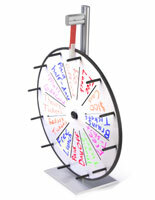 Fully customizable wheels that come with easy-to-use DIY templates that allow users to design and print graphics, brand logos, and inserts straight from their own computers. 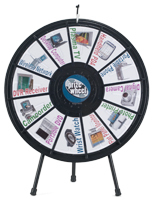 The use of branded messaging, such as imaging at the center of the wheel or name-label giveaway choices, creates a professional, high quality look that engages customers or patrons in commercial or trade show environments, and builds excitement in office games, meetings, or for schoolroom educational use. 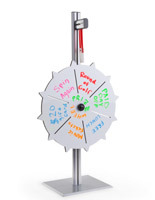 What are some availble options for roulette-style spinner games? 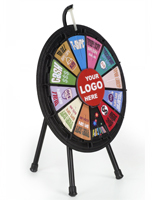 Easy to assemble promotional spinner fixtures are designed for ease of use as well as portability. 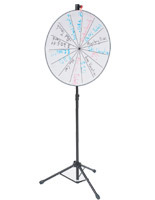 Many of these units feature a two-piece design with separate body and stand. 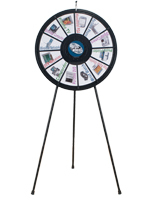 Portable, cheap trade show accessories are extremely simple to assemble, and require no additional tools to put together, whether made of durable plastic, metal, or simple cardboard. 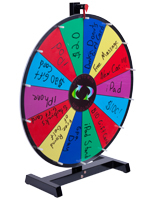 One person can easily assemble any of these promotional wheels in a matter of a few minutes, making them ideal for off site events. 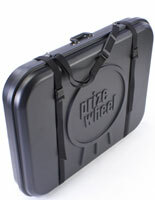 Many businesses that frequently attend trade shows, conventions, conferences, or industry fairs choose to add a hard-shell plastic case for convenient, safe transportation. 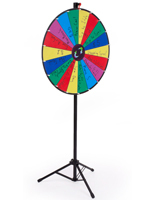 Two-piece game spinners for offices or commercial events are also designed to be easy to store when not in use. 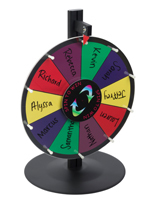 In addition to customizable slots, lighting options, and user-friendly design, another element that sets roulette-style wheel games apart is the sound. 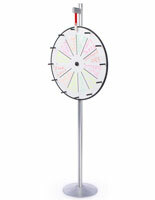 The noise of the spinning clicker is unmistakeable, and easily attracts passers-by to come and explore the source. However, not all environments, such as schools and dental or medical clinics, are appropriate for a high level of attention-grabbing sound. 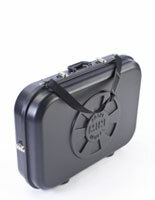 To this effect, we have taken sound into consideration and provide noise level indication on every product description. 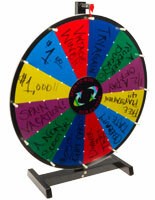 In addition, many game spinner models offer removable pegs or "clicker" tabs that help reduce, or even eliminate, noise. 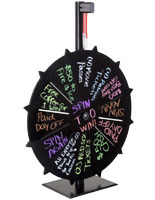 Looking for more information on incorporating spinning games of fortune into promotional events, meetings, or everyday business promotions? 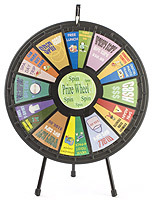 We've put together a convenient prize wheel games article full of ideas for businesses, organizations, schools, and event use! 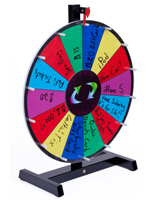 In addition to these crowd-pleasing spinning roulette-style displays, Displays2go also offers hundreds of other business and tradeshow promotional accessories, such as ballot boxes, raffle drums, and other games of chance. 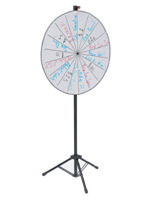 For a more complete selection, our main shopping page offers retail, point of purchase and promotional supplies for every industry, all with with budget-friendly wholesale pricing and fast shipping. 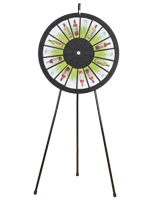 In fact, most in stock fixtures ordered before 3PM EST on weekdays ship the same day.